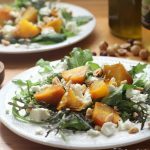 The salty feta compliments the sweet golden beets in this beetroot and feta salad beautifully. Add toasted hazelnuts for a little crunch. This simple salad is really delicious, easy to prepare, and makes a fabulous lunch. Serve on it's own or with chunks of crusty bread. Preheat the oven 180℃ /160℃ fan/gas mark 4. Spread the hazelnuts out on a baking tray and toast in the oven for 10-12 minutes until golden. Cool and coarsely chop. Set aside. Meanwhile, trim the beetroot and place on a lightly oiled baking sheet. Roast in the oven for 45 minutes or until tender when pierced with a skewer. When tender remove from the oven and allow to cool. Once cool enough to handle remove the skin, which will pull away easily, and cut into wedges or chunks. Pile the salad leaves onto serving plates and arrange the beetroot on top. Crumble the feta over the salad. Whisk the ingredients for the the dressing together with a fork and drizzle over the salad. Scatter with the toasted hazelnuts and serve immediately. Serves 4 as a side dish or 2 as a light meal.